In the hills of North Vietnam goats roam freely to browse on the verdant vegetation. Their meat is tough and gamey. To keep it tender, thin slices of meat are quickly poached in a ginger broth then marinated in lime juice. Poaching isn’t necessary with the mild flavored, tender market goats in theU.S.A quick stir fry is a better method to maintain the flavor and texture of the meat in this recipe. The other ingredients balance brightness, richness, toastiness…all important to the whole so don’t leave anything out. Slice the goat into thin strips (you can freeze the meat for 20-30 minutes to make it easier to slice). Heat a small non stick fry pan over medium high. When hot, swirl the oil to cover the bottom and add the garlic and ginger. Cook 1 minute. Lay the strips of meat in the pan and let cook without stirring for 1 minute, until lightly browned. Remove the pan from the heat, flip the meat strips over and let cool for a few minutes. Remove goat and browned bits to a medium bowl and toss with lime juice, shallot, salt and sugar to coat well. Place a lettuce leaf on each of four salad plates. Make the drizzle sauce. 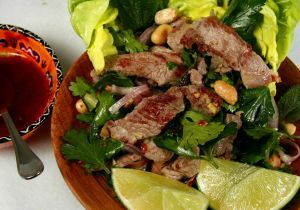 Add the cilantro, mint, sesame seeds and peanuts to the goat and gently toss. Portion the salad onto the 4 lettuce leaves. Serve at once (so the herbs don’t wilt.) At the table drizzle with sauce and form a roll to eat by hand.